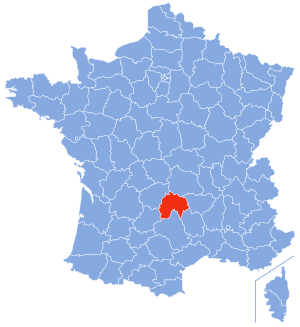 Cantal (Occitan: Cantal, Cantau, Chantal, Chantau) is a department in south of France. Its name comes from the Cantal mountain range, some extinct volcanic peaks. Its population is 150,778 (1999) and its prefecture is Aurillac. It is also one of the 83 first French departments made during the French revolution. Cantal Facts for Kids. Kiddle Encyclopedia.